​Yogic philosophical precepts of Patanjali's Yoga Sutras, which detail moral and ethical growth and responsibility are the underlying foundation of our teachings. 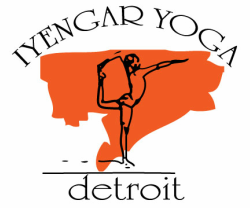 Our Certified Iyengar Yoga teachers provide students of all ages and abilities an experience of yoga which is physically energizing, emotionally balancing, and mentally rewarding. Our highly trained teachers use their deep-seated knowledge of asana to instruct, observe, and individualize corrections for each student. Deep study and practice leads the student to an overall transformation of body, mind and spirit. ​Exploration of the fundamental asanas. Encouraged for students new to yoga and new to Iyengar method. Continuing Iyengar Yoga students with at least 6 months study. Headstand and other inversions are introduced. Experienced Iyengar Yoga students with at least 1 year of consistent study. Expect refinements, more complex poses, plenty of inversions (5+ minute holds in Sirsasana and Sarvangasana), backbends, Padmasana variations, arm balances, and philosophy study. Openness, willingness, and ability to observe and learn are the most important criteria. Safe space to address specific uterine needs, such as pregnancy, postnatal, menstrual and menopausal conditions. Room curtained for privacy. Multilevel class for Black, Asian, Latinx, Native American, Middle Eastern self-identified people of color. Uplifting poses to deal with SAD (Seasonal Affective Disorder), and general anxiety and depression. Focus on standing poses, backbends, and beginning inversions. We will be reading BKS Iyengar's Light on Life throughout 2019. Please join us on the 4th Sunday from 6pm-7:30pm for this Community Gift class. Focus on spinal health, alleviating back pain, and healing neck and shoulder injuries. Open to all levels. This is a time to engage in your own self-study and practice while having access to the props and rope wall at the studio. This is a self-directed time and while a teacher may be on hand, they will not be leading the session. Community gift sliding scale, $5-20, applies.